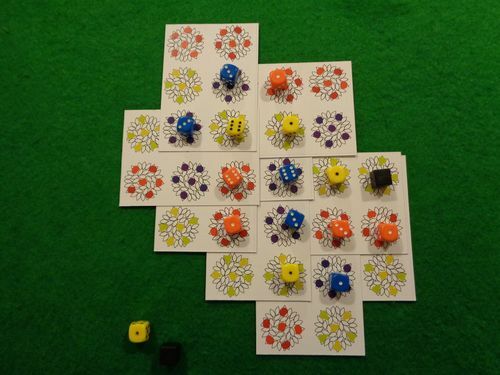 A quick solitaire tile laying game. Try to collect as much fruit as you can from the three types of tree in your growing orchard. The theme is somewhat pasted on - I needed three easily distinguishable colours and somewhere along the line red, yellow and purple became apples, pears and plums (these colours also work for colour-blind players). I scribbled some cards in order to do some initial playtesting. Shuffle cards and place one face up to make the start of the orchard. Draw 2 cards and play one of them so that at least one tree overlaps a tree in the orchard. Any tree(s) that overlap must bear the same fruit. Place a die of that tree's fruit colour on the tree(s) so that it shows a '1' uppermost. Whenever another tree is placed on top of a tree already with a die, you place that die on the new tree, and rotate it to show a higher number (first 3, then 6). You can also place a cube on a tree to allow it to overlap a tree that bears different fruit (but only if it does not have a die on it). However that tree will then locked and a tree (or dice) may not be placed on it. Thematically, the fruit on that tree have been spoiled. You then draw another card to make your hand back up to two. Once all cards are played, count up the dice score. Subtract 3 points if 'rotten' cube was used. The final score represents the amount of fruit you 'picked'. I need to check whether the various tree arrangements are balanced across the cards. And more play testing is needed to see how replayable and fun the game is. As it plays relatively quickly, I want that 'just one more go' feeling. I also need to get an idea of what a good (and bad score) is. Then I'll do some nicer graphics for the cards, write up some rules and upload the files. I'm looking forward to playtesting this. 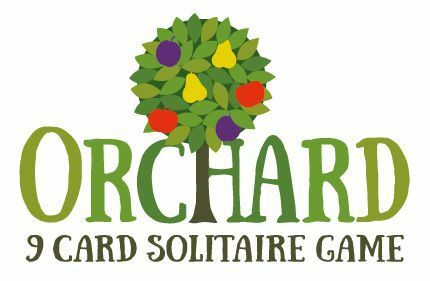 Searching the BGG database, there exists an old boardgame from 1986 called Orchard - reimplemented as 'The Orchard: Card Game'. It's nothing like this one, so I think I'll keep the name as it is. Maybe I'll add a different strapline at some point (if I can think of a better one than 'A 9 card solitaire game') in order to help differentiate it. The original game may be from 1986, but it is still actively in production and sold worldwide -- it is a well known young kids game. I know 5 people who own recently purchased copies of it. You may get into some legal issues naming a game the same thing. It's actually perfectly legal to name the game Orchard, as a name itself cannot be copyrighted. There may be a concern if the name is Trademarked, but I sincerely doubt that can be done with a common word like Orchard. No, Orchard the board game is not trademarked. (I was right about that one.) But Orchard has been trademarked by other things. I believe the trademark has to be the same product to hold up, so you should still be free to use it. However, when in doubt, change the name to Apples to Apples. Within the confines of a little PnP game I think it will be fine. I felt confident enough to draw up and print out some 'low ink' cards to do some more play testing. Scored 34 here (best to date). The 'rotten fruit' cube does seem to add another layer of strategy. It can help you lay a card that you wouldn't otherwise be able to - but comes with a points forfeit. So you must decide if and when to play it. There are now 2 cubes available (I only had one in my first iteration). Ideally you don't want to end up with any rotten fruit at all, so the card you lay with it on really needs to be gaining a good few points for the forfeit to be worthwhile. But, the earlier you place a cube, the more it will restrict placement of subsequent cards. 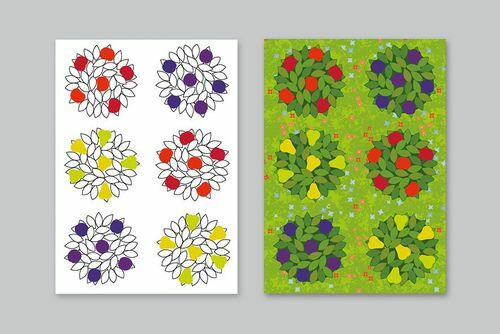 I'm now thinking that just 9 tree arrangements may be a little restrictive so I'm considering putting a further 9 on the card backs. This would add more variety but would mean drawing then flipping each card to play it (i.e. you don't get a choice of which side you use). I'll test this idea out next to see how it works. Tried out a few games with the trees on each side of the cards and I think it's better for having a greater variety of tree arrangements. I now need to get the rules finalised - should fit on just one page. I may also do them as a card-sized mini booklet. As well as low ink cards, I've done a sample in full colour. I'll finish these over the weekend so you'll have a choice of versions if you fancy giving the game a go. Looks great Mark! What do you use to make your art if you don't mind me asking? Interested in play testing this so when you have to components please let us know. Also, so did you change the name of this game? I'm going to post the links on the main contest thread but need to know whish name you are using. I use Adobe Illustrator (also Photoshop - although not for this one). I decided to keep the name as it is. There's a low ink version as well as full colour. The rules are on a single page, but I've also done them as a card-sized mini booklet. Others may want to try Inkscape and GIMP as alternatives. Definitely not as fancy or polished, but they are free and perform many of the same features. Thanks a lot Chris! I appreciate the tip. I'll check it out. Fabulous little game, Mark, I especially love your artwork! The theme didn't feel pasted on to me. My first play test scored 30 points which I felt pretty good about. I did use one rotten fruit cube to place a card, but it worked out well because I was able to upgrade the five other spots on the card, all of which had fruit already being harvested (dice down), making a big harvest worth the smaller loss, IMO. I like that the cards are double sided, giving you a different variety each game. I just had to remember not to flip them back over when trying to figure out where to place them, as I wanted to flip them over to try something else. 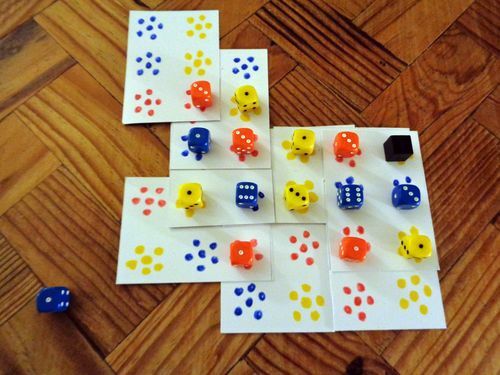 The game feels balanced and having the option of two rotten fruit cubes adds some additional strategy. The rules were very clear and succinct. Overall, it seems pretty perfect to me. I like your game so much that I laminated the cards. Even if future changes are made, the current version is perfectly playable and enjoyable, so they were worth it. I look forward to more play tests! Oh, and I applaud the "HOW FRUITFUL WAS YOUR HARVEST?" section of the rules. Clever and funny! Haha. Yup, I missed it. I like to try to get the odd pun into my games. Many thanks for playing and feeding back. What a fun game! So easy to learn, very quick to play, very challenging but not too much of a thinker that you get AP, easy to understand rules, and an overall great job. I've played a few games now and I'm averagin around high 20's to low 30 without using the rotten friut cube. I wanted to see just how high of a score I could get not using this bonus and this seems to be around average for me. I'll play more trying out the rotten fruit to see how much more it affects my score "which I have a feeling will be a lot higher". Game play: I really can't see anything else that would make this game any better than it is. It's so addictive and with it being such a quick play it really makes you want to play it again and again. Mark of a good game is the desire it produces wanting you to play it agian. Big thumbs up on this. The mechanics are simple yet strategy and spending some time thinking out each move will get you the most points. It really is elegent in its simplicity. Art: I love the art and the fact that you only had to use three main colors is great. I think adding more colors "fruit" will only work with more cards such as the 18 card or higher; let's stay with the 9-card for now. Theme: The theme is nice and you could use a number of different themes to change things around: cars, tents, animals, houses, balls... I think you get it. The theme doesn't feel pasted on and works really well. One idea I had while playing was it would be nice to be able to flip a card in yoru hand if you get stuck and to do so you would have to sacrifice a die value downwards from 6 to 3 or 3 to 1. Another idea was that since you are always stacking cards it would be cool if you had a option to drop a card already placed down a level to open up some new possibilities but to do so you would have to remove any dice on it. Overall, great job on the design and lots of fun. With Rotten fruit I'm averaging mid 30s but haven't yet broken 40 - sure it's possible. I'm happy to hear this. As I mentioned in my first post, my aim was to make a 9 card 'tile layer' that had that 'just one more go' feeling. The quick set-up and play time does help. More cards would mean needing more dice - so may become less accessible then? For a theme to work I think every element/mechanic of the game needs to relate and make sense in the chosen 'world'. 3 different colours - so types of 'fruit' work as they naturally have associated colours. An expanding 'tableau' - thematically an 'orchard' then makes sense. Points accumulation - equates to the amount of fruit 'harvested' as fruit picking certainly exists in the world of orchards. Points penalty - and we can have some 'rotten fruit' as the reason for a points deduction. An interesting exercise would be to take each of your suggestions (cars, tents etc) and see how well the theme fits to each part of the game. e.g. for tents the 'tableau' could be a camp site - but then I'm not so sure what would work for points scoring and penalty. Originally the game had no rotten fruit cubes. Gameplay did feel 'pure' in this form but I doubted it's longevity. So the cubes were added to create some addition strategic decisions. They're interesting ideas. I'm not sure how fiddly it would be to slide card under others. Did you find it awkward when 3 or more dice were involved on a turn? 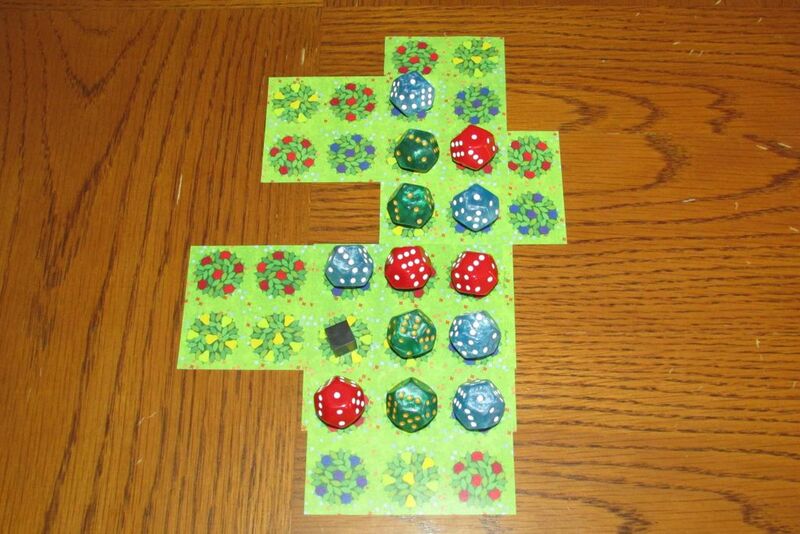 I end up lifting the dice off, rotating them and placing them, one by one, on the new card as it 'hovers' above the orchard, before laying the new dice-laden card down. One thought I had was to have some cards with a space where one of the trees would normally be. This would in effect be a 'wild' space onto which any type of tree could go. But I haven't tested this and may be something to consider for an 'expansion'. Thanks again for playing and feeding back.